Your help would be appreciated, please contact me Your response will be added unless you ask otherwise. 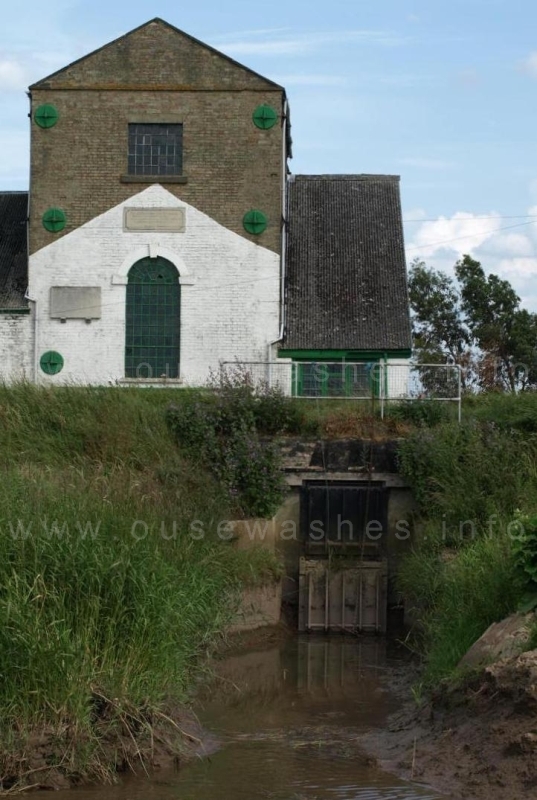 This pumping station, or "engine", a couple of miles north of Pymoor, sits just a few feet from the B1411 road on the eastern side of the South Level barrier bank and the Hundred Foot/New Bedford River. 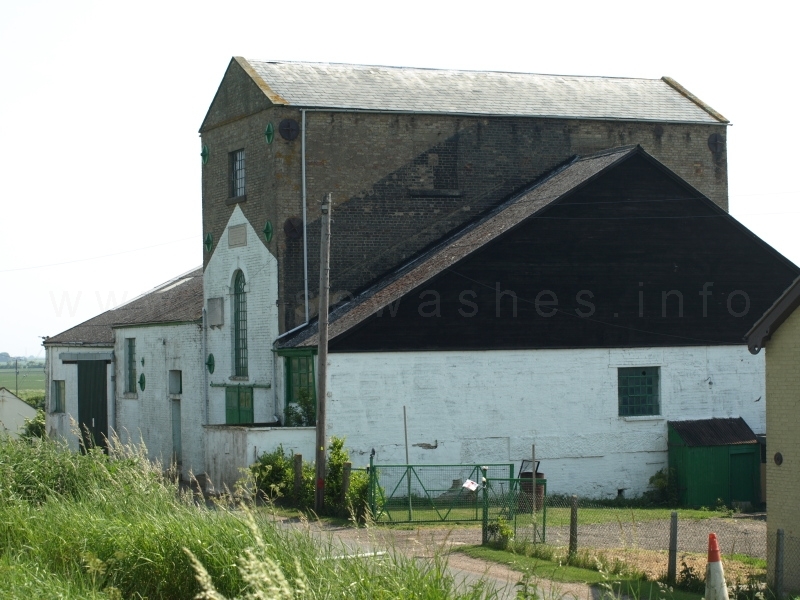 It was built in 1830 to replace wind drainage-mills. 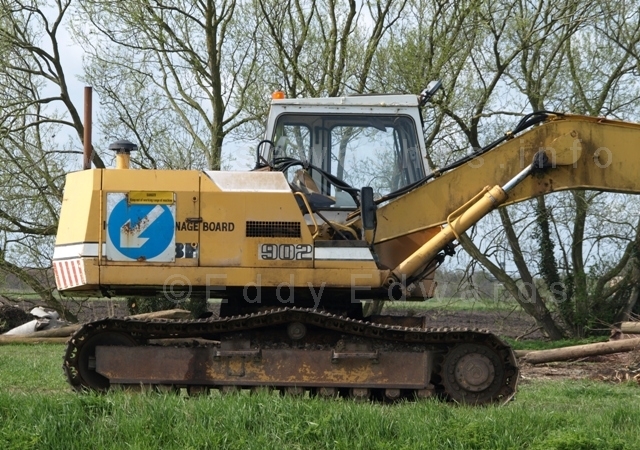 It is owned and operated by the local drainage authority, the Littleport & Downham Internal Drainage Board, which is responsible for draining 13,000 hectares	(32,000 acres) of the South Level, and is the largest member of the Ely Group of IDBs. I've long had an interest in this place, having driven past it to and from work for several years, but it wasn't till early 2010 that I had time to stop and look around and take some photos. I was hooked, and soon posted a web-page about it based on my own observations and web research. That led me to look at other structures around the Washes followed by the launch of this website in 2011. In May 2013 Chris Holley found my site, contacted me and later introduced me to John (JS) Martin, a member and ex-chairman of the IDB who kindly provided documents and gave a guided tour of the station which enabled me to completely re-write the page. Since then the ex-Chief Engineer of the IDB, Tony Goodge, has kindly provided yet more information and some previously unpublished plans and photos from his collection. Along the way a number of other visitors have made small but valuable contributions, and I am greatly indebted to all who've helped. What you see as you drive past are the large original buildings close by the road, once part of the coal-fired steam-powered station. 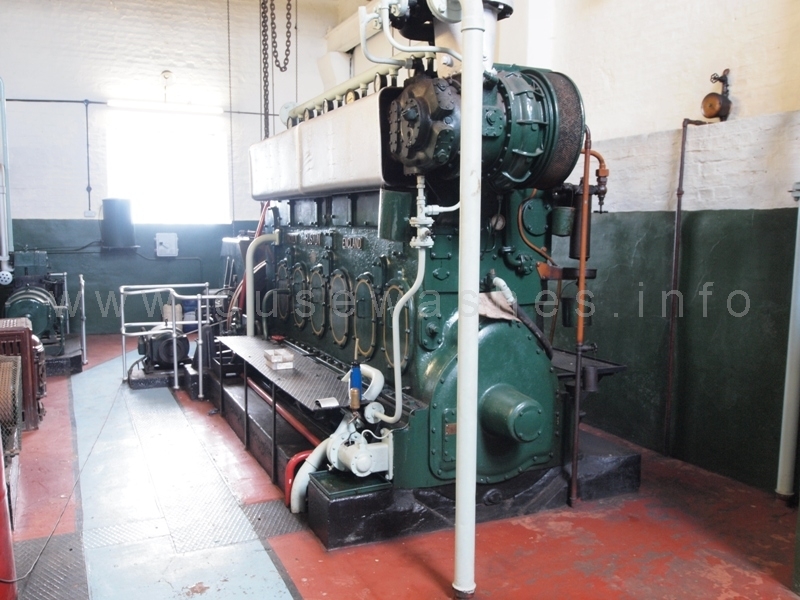 The steam engines have long since gone and the buildings are now used as workshops and for housing a stand-by diesel engine with its pump and oil tanks. What you may not notice at first is a small modern unprepossessing building further away and below the road - part of the "New" electric-powered pumping station used today. Photo: EE, June 2010, the electric station seen from the top of barrier bank. To appreciate the vast size of old buildings and appreciate the spread of this station, you need to walk along the footpath just outside the northern edge of the site, and look back from beyond where the intake drain splits into two channels, where you will see the view below, although now high metal-staked security fencing surrounding the area spoils the view. 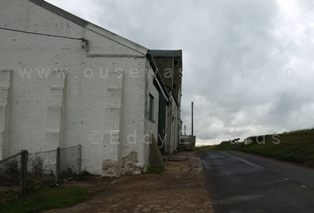 Left and centre are the buildings of the old steam/diesel station, on the right the "New" electric station. more of Intake grill below. 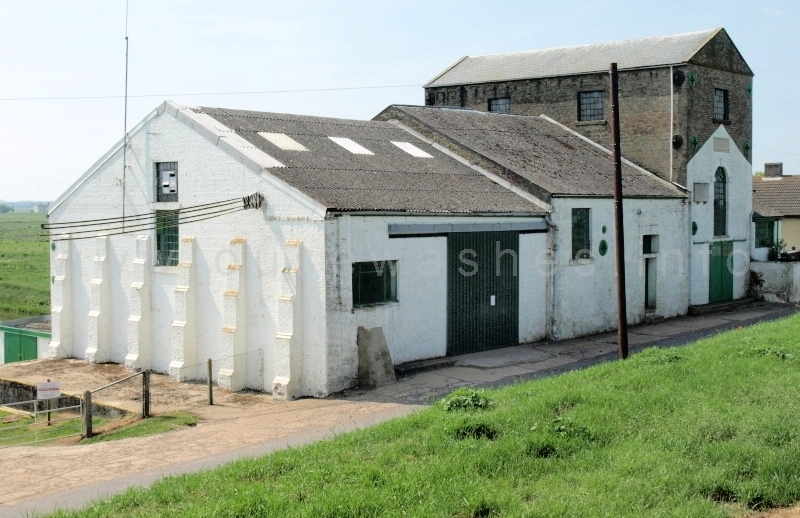 Workshop (once the coking shed) with a lower store or workshop in front. 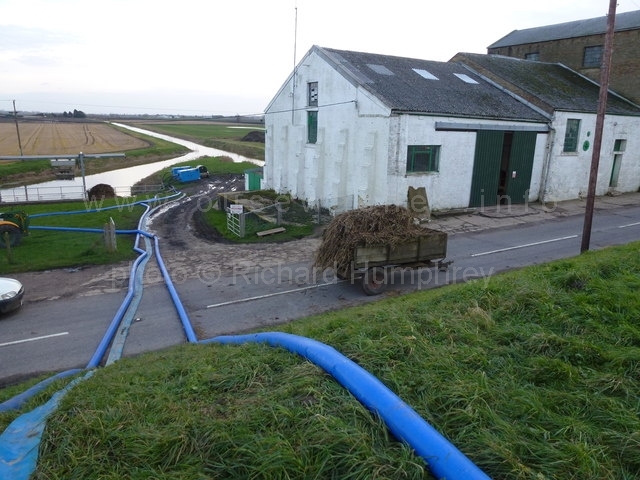 Green covers (on top of the 100 Ft river bank) over the syphon valves on the new discharge pipes. Intake grill with automatic weed grab above it. electricity sub-station, part hidden by bush. Note roofing on the old station. Engine house is slate tiled but other buldings appear to have corrugated asbestos sheets which were not produced until the 1920s, I wonder what the original roofing was? river left-centre to top. 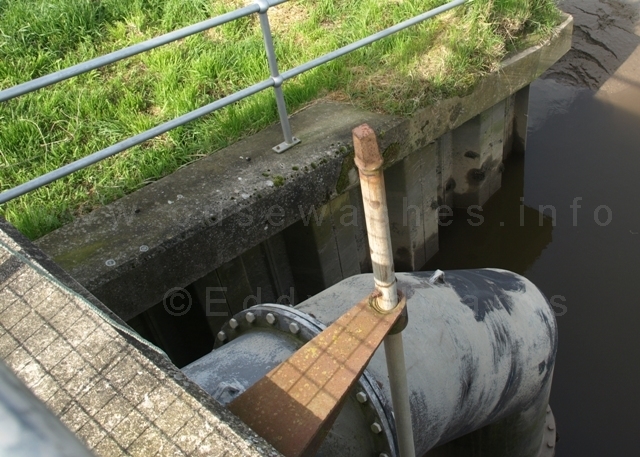 The IDB's drain, coming in from bottom right shows the original intake cut in 1830 and the branch forking off towards the top cut in 1926. 1914 Butterley beam engine & scoopwheel scrapped. 1985 old steam station made Grade II* listed building. 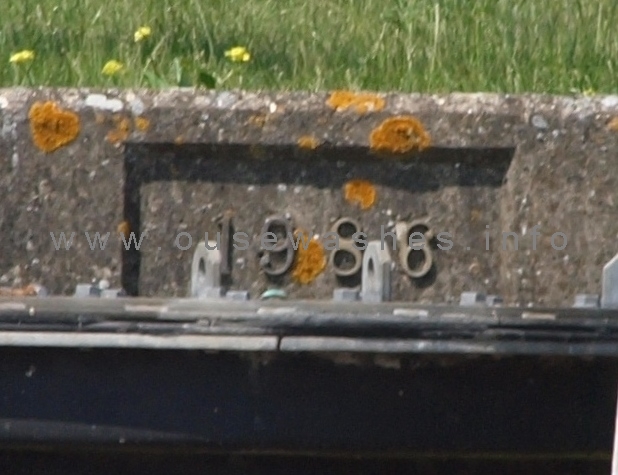 1.7 Near site of Mirrlees with same intake channel. 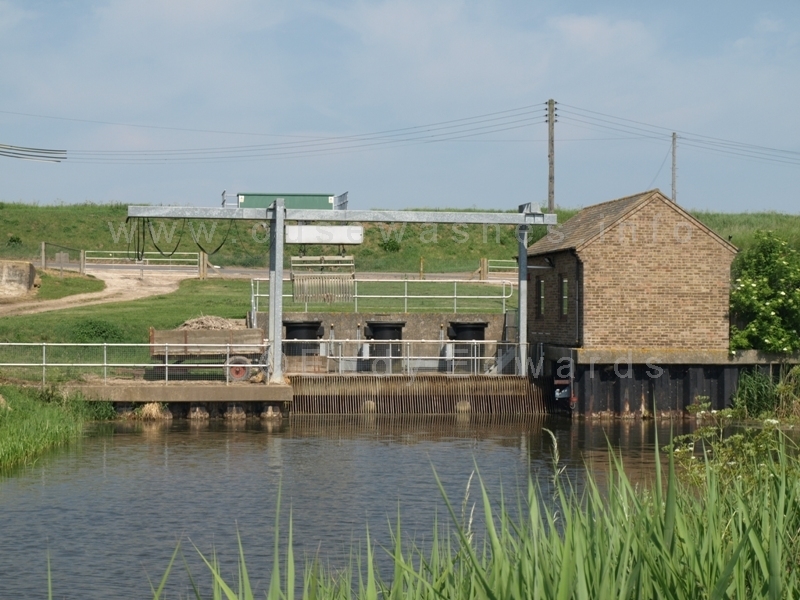 The pumping station was built in 1830 to a design by Joseph Glynn of the Butterley Company of Derby. 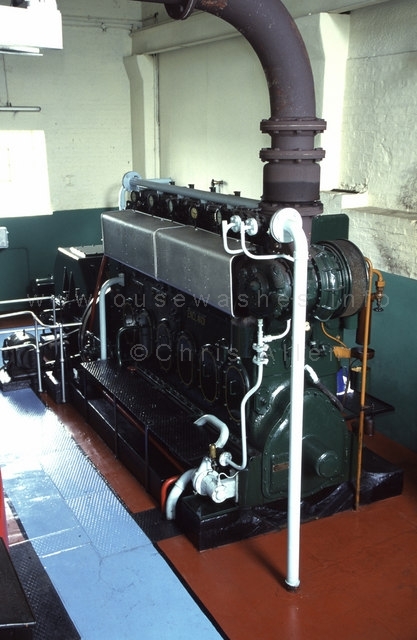 Glynn also designed the original Butterley 30hp beam engine. The engine was virtually the same as the restored one at Stretham Old Engine. Images left and right are taken from photos displayed on wall of engine room. Left is the 26ft 3in diameter flywheel and centrifugal governor, c1913. On right the 26ft long beam of the Butterley engine. 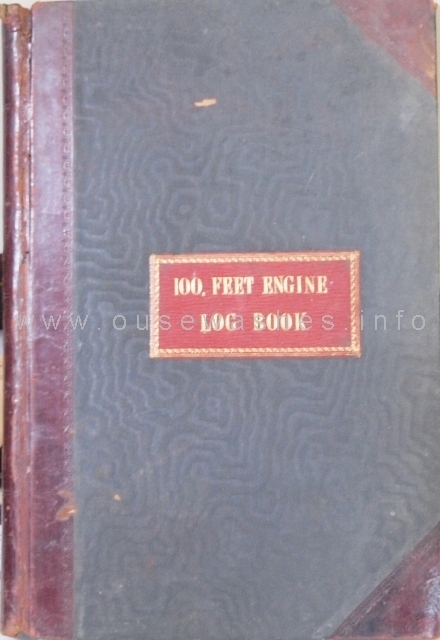 The men in charge of the steam engines (and usually the whole plant) were known as 'Engine-drivers' and they kept a daily log of running hours and coal consumption, often in beautifully bound books such as this one. Most logs provide interesting figures. For instance, here in the year April 1841 to March 1843 (presumably a wet year) the engine was run on 192 days and 96 nights, a total of 3729 hours, and 1,397 tons of coal were delivered. In Oct 1861, the log shows that on the 22nd nearly 76 tons were received from Captain Cooper, at a cost of 15s 6p per ton plus 6d a ton for porters. Glynn and Butterley supplied package deals of plant and buildings to many of the early steam-engine stations in the fens. Glynn is sometimes confused with Gwynne, a family-owned company that built the second steam engine here (see below) which wasn't founded until 1849. Even the citation on the English Heritage site is wrong in that respect. It was the District's second steam engine, replacing (one of ?) seventy-five windmills in the area which apparently hadn't been able to cope with the heavy rains of 1824. It was built with gault bricks on a raft of 600 piles with 300,000 bricks (source: English Heritage as above). on the left, the wheelhouse protrudes right to the road edge. On the right can be seen brickwork in the bank. The discharge side seen here from the west bank of the river after a long trek from Suspension Br. Front of engine house (left) and wheelhouse and discharge into the tidal river. 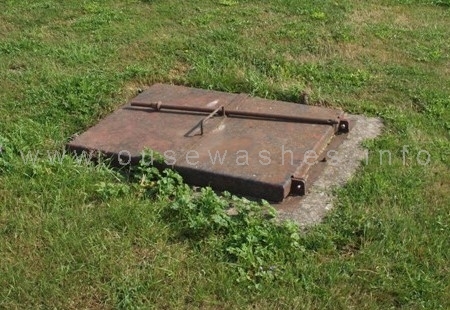 There are two gates, can't tell if flap or lift, or whether one or both are used. The Butterley engine was considerably improved in 1882 by alterations to valve gear and increasing boiler pressure. The new output of 224hp enabled a larger scoopwheel to be fitted, 50 feet in diameter and weighing 75 tons, the biggest in the fens. (Source: HC Darby, p198). 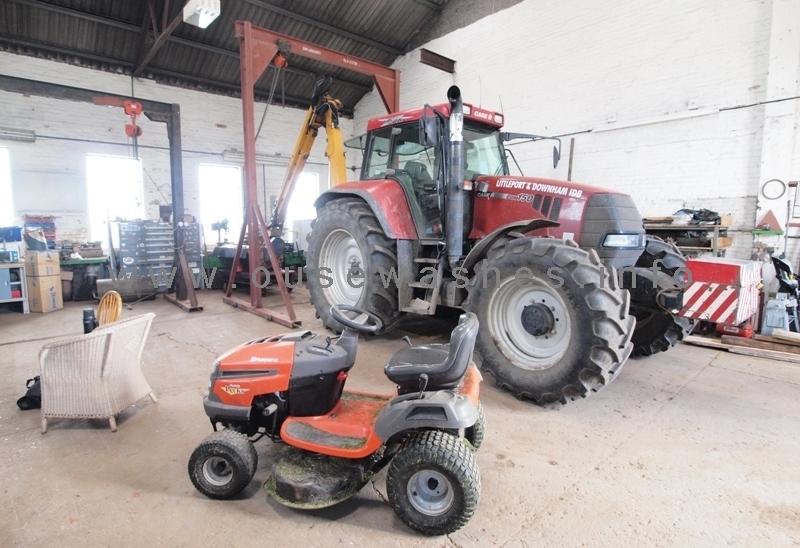 The new wheel was required due to further shrinkage of the soil lowering the level of the fen lands. 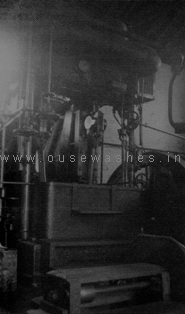 In 1911, the three boilers were replaced with high-pressure Lancashire boilers. I don't know whether this was because the old boilers, two of which were 42 years old and the third 36 years, were simply worn out, which is quite possible, or whether it was the first stage of plans to completely re-equip the station. 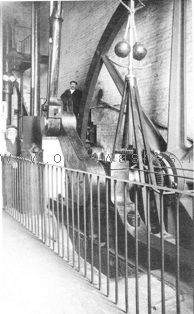 Anyway, three years later, in 1914, the Butterley beam engine and scoopwheel were replaced by a vertical steam engine, by Gwynnes of Hammersmith in West London, coupled to a Gwynnes 50-inch centrifugal pump situated in the old wheelhouse. 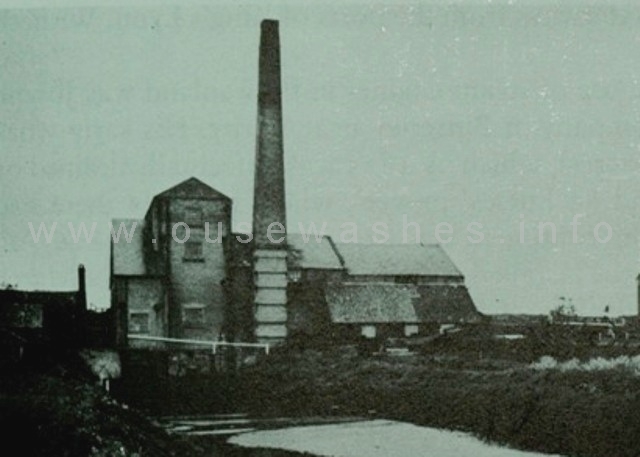 Perhaps if the boilers hadn't been replaced, the Board may have decided to convert the plant to oil like the one at Methwold & Feltwell in 1913. 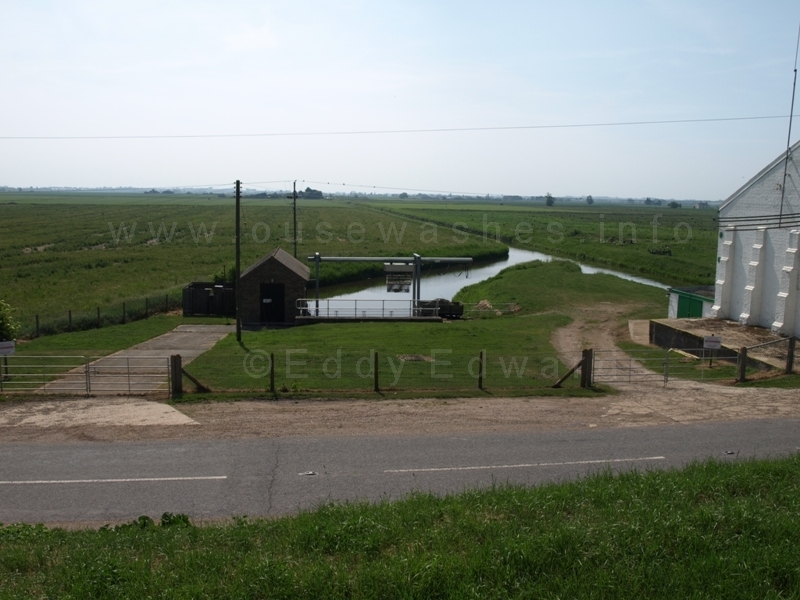 The station was fuelled by coal, presumably brought up the tidal Hundred Foot River by fen lighters from the port of King's Lynn, and discharged by hand, labourers barrowing the coal over the bank and into the coal yard or coking house north of the boilerhouse. Buldings can often tell you a lot about themselves. the "Eagle Foundry Co Ely". Unfortunately their offices at 6a Downham Road Ely are now those of a distance learning centre for dental nurses. The height of the wheelhouse roof has changed three times. If you look closely you will see a line on the engine house wall about 1½ feet above the current roof, and I assume that would have been the original height in 1830. I don't know when or why the roof was lowered, maybe in 1914 when the scoopwheel was replaced by a pump? Note the green "lean-to" on the gable wall. More about that further down. Above the arched window of the engine house roadside gable-end (see above centre) a stone is inset inscribed with a now much quoted rhyme. And the Destroyer by Itself destroy'd"
Photo: Eddy Edwards, July 2013 In 1951 a Ruston Hornsby 6 cylinder water-cooled turbo charged diesel engine, model 6VEBX weighing nearly 15 tons (rated at 540 bhp according to Mr KSG Hinde) was installed in the steam house to drive the 1914 Gwynne 50" pump (via a 90˚-turn gearbox) in place of the 1914 Gwynne steam engine. Output said to be 200 tons per minute, virtually the same as the Gwynnes steam engine. Above, Mr JS (John) Martin, a member and ex-Chairman of the IDB Board is examining the work log. There are very few changes compared with the scene 17 years earlier (photo on left). Aerial view of the station c1971. 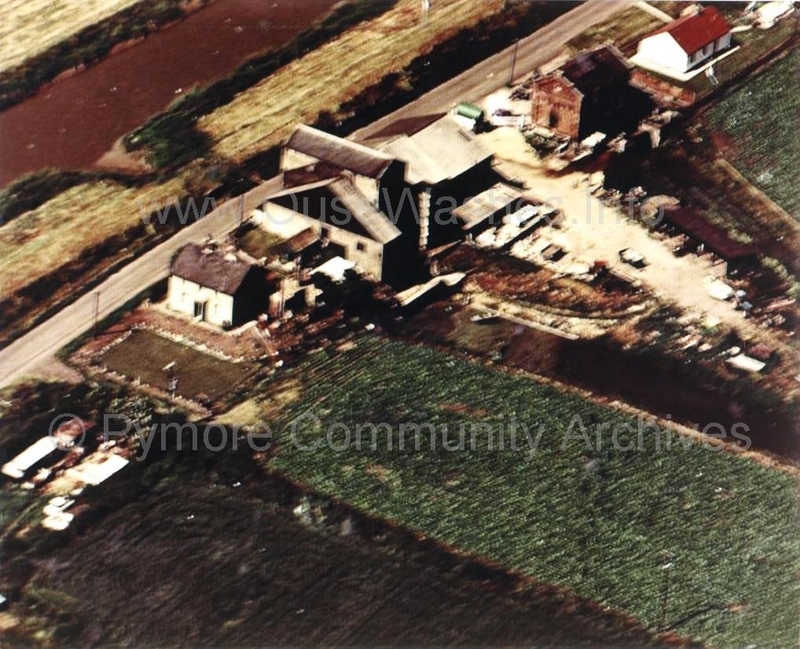 Photo: was on the CCAN/Pymoor archives but now unavailable there. The Ruston became "redundant" in 1986 when the new electric-powered station was completed, but was retained as an emergency stand-by. 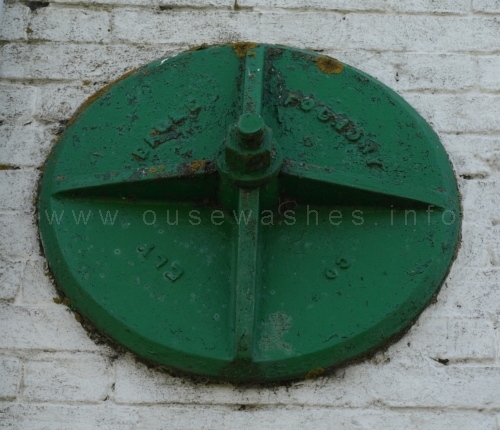 It was used in Dec 2012 coupled with the 1914 Gwynnes pump during high rainfall and failure of an electric pump. See report below where there is also link to a video. of a running engine. According to the citation on the English Heritage page made when the station was listed in Feb 1985, the paved second floor of the steam engine house and stair was intact; and the lower galleries had been removed. 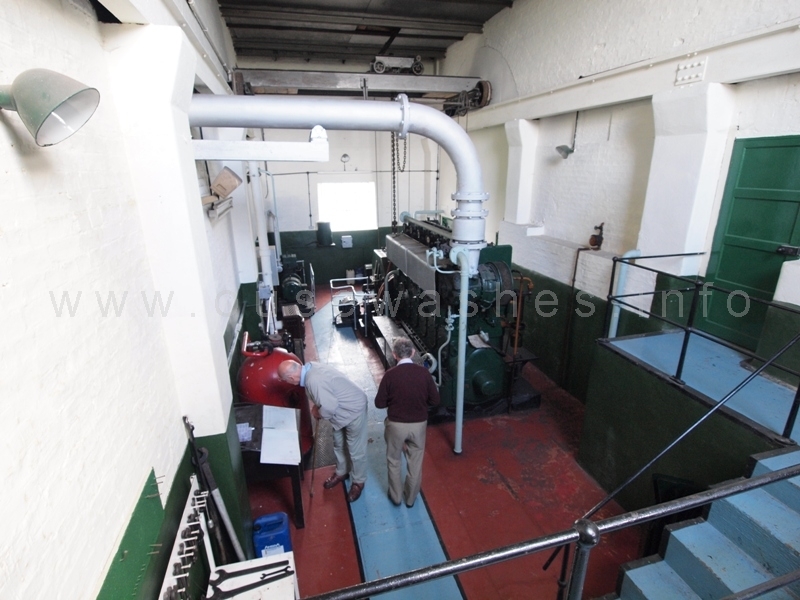 The old Lancashire coal-fired boilers that fired the steam engine have been retained and converted to store the diesel fuel. Tidal river left centre to top. 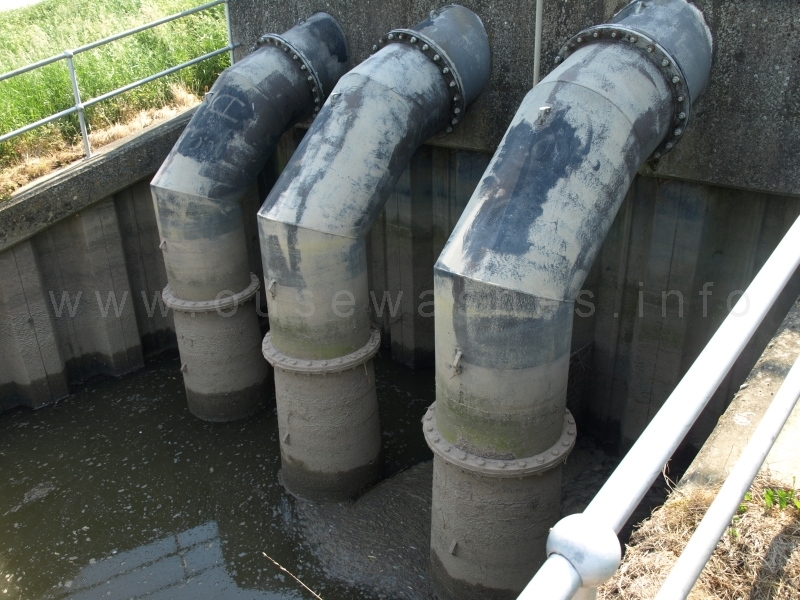 IDB drain bottom right divides into two intake channels, the new one above. Electricity took over from diesel in 1986. 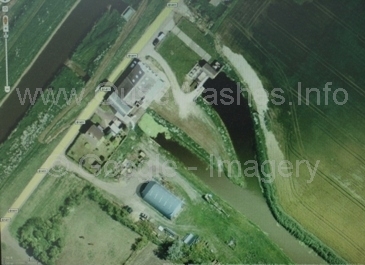 The 1926 building at the head of the second cut that had housed the Mirrlees diesel engine was demolished (the engine was removed earlier, see above) and the "New Hundred Foot Pumping Station" built to the south-east of the Mirlees House, i.e. further away from the road. The oft-quoted statement that the new electric station was built on the Mirrlees site seems incorrect when comparing the satelite view on the left with the c1971 aerial photo on the right (the latter was on the CCAN/ Pymoor Community Archive website in 2010 but unavailable there in 2013). Driving past the site it is easy to miss the New Station. The only signs are a small nondescript brick building, a couple of poles and an odd looking steel structure above the end of a drain. 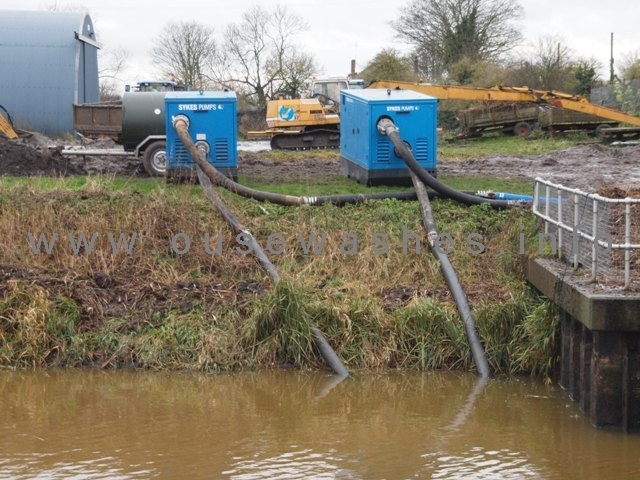 Housings for the electric pumps cannot be seen from the road. discharges into a rather unsophisticated old farm cart. Above is the New Station as seen from Hundred Foot River bank. 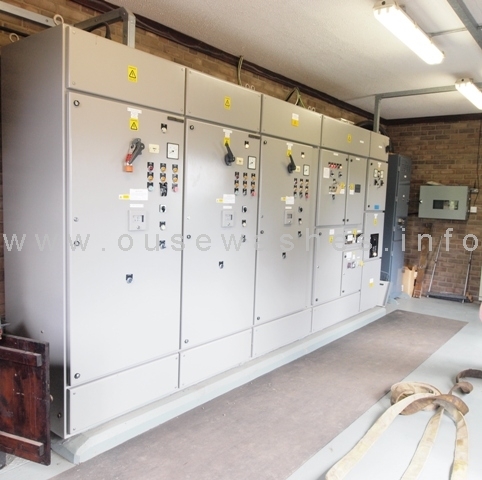 The gate and track on the left leads to the sub-station with its wooden fencing. The small brick building is the control room, and the steel structure is a weed grab. 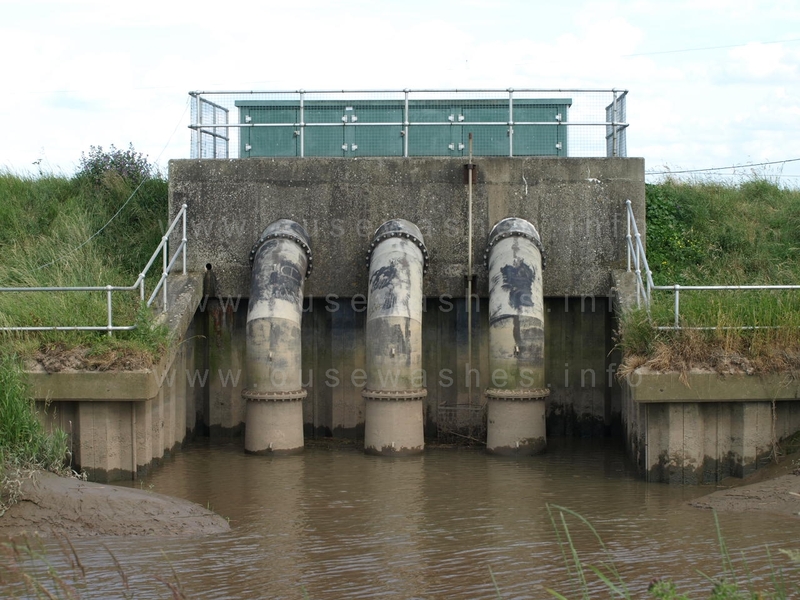 Below that, and hidden from the road, are three steel pipes housing the powerful electric motors and pumps. 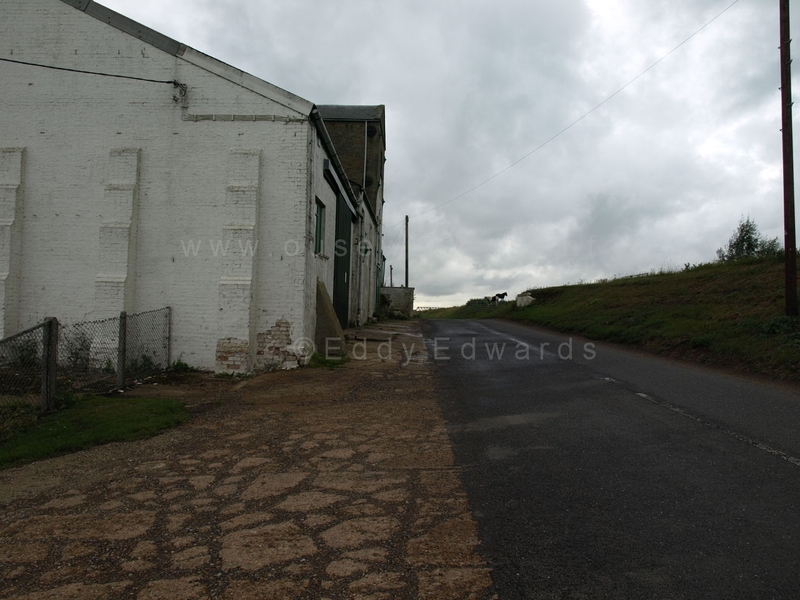 Photo: Eddy Edwards, July 2013 Below is the station seen from the back. The weed grab (which operates automatically) was not part of the original design, and is a relatively later addition. Photo above was taken from the far bank after walking from Suspension Bridge en route to the railway viaduct. access to irigation divertor valve. irigation outlet into old channel seen from back of old station. 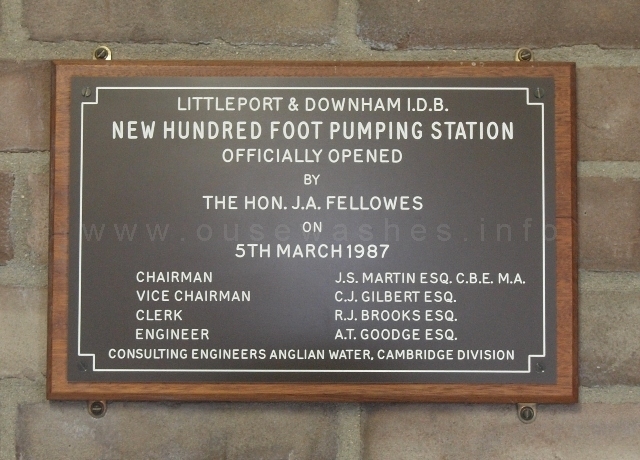 In 1986, during construction of the new electric pumping station, an irrigation inlet was incorporated, to take water from the Hundred Foot/New Bedford River to the IDB's drain. 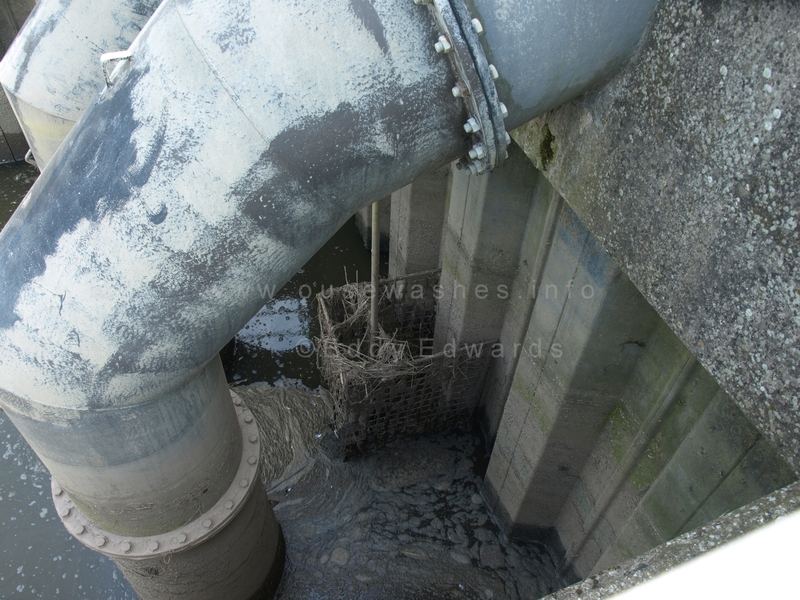 Between the centre and right-hand discharge pipes (see above, and above right) there is a manually operated rod which controls the irrigation slacker which can let water into the IDB system from the tidal river. 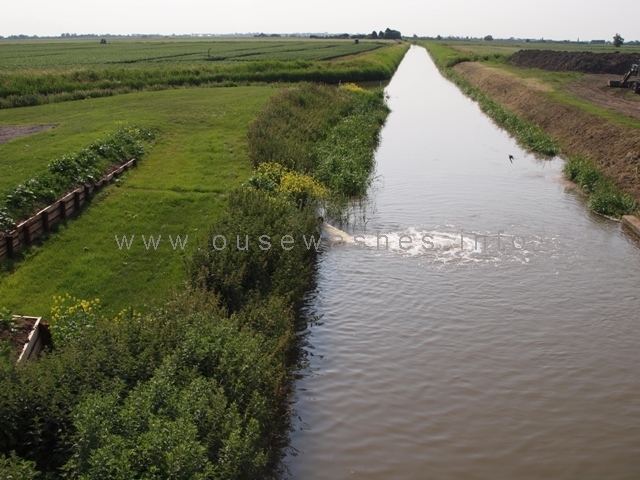 When opened, water flows through a 10 inch pipe to a point in the grassy area about half-way between road and the new intake where there is a manhole cover giving access to a diverter valve allowing discharge into into the old channel (see photos) or into a field drain to the northeast. II guess mid 1980s-90s vintage with a very, very long reach! here fitted with lifting forks on front. TThe IDB have some impressive equipment for maintaining their 193 miles of drains spread over 30,000 acres (2003 data, source: ref 3 in table above). 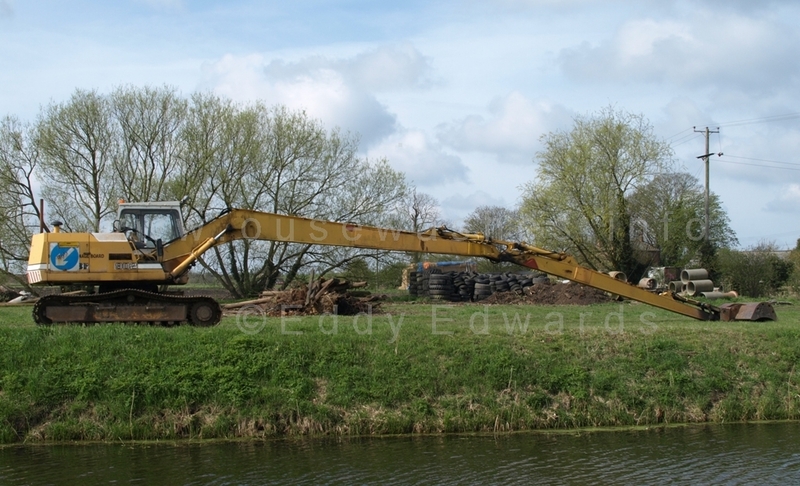 The nearest is a 2001-ish German built O&K MH4,5 Cityline, weighing in at about 13.5 tons, with a 9.4m reach. Very heavy rainfall in the UK during Oct-Dec 2012 resulted in waterlogged fields and potential flooding over much of the country. In the South Bedford Level where much of the land is below mean sea level, the drainage authorities faced difficult times. 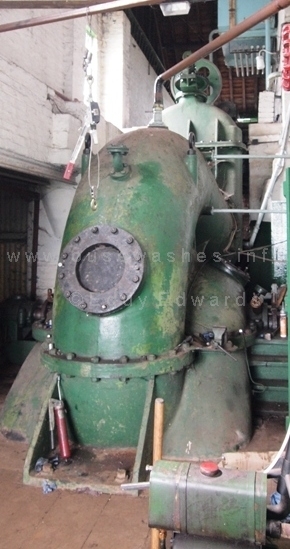 At this pumping station auxilliary pumps were brought in just before Christmas and the old Ruston was also used to help kep the IDB system drained. 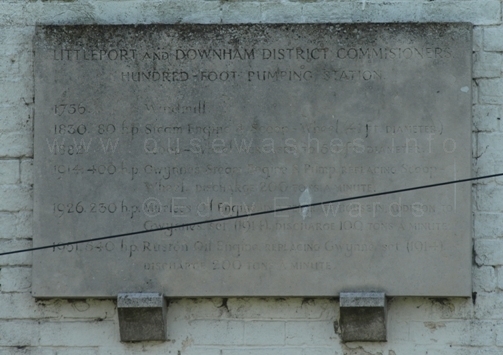 "the 'redundant' diesel engine was used to lower the level in the pound by over a metre when despite the use of auxiliary pumps (necessitating the closure of the road for their output hoses) the drain levels were increasing - in view of the frequency of power cuts in the pymoor area and the impracticallity of providing generator capacity to power the electric pumps it is important to the whole of the South Bedford Level for the Ruston diesel to be maintained in a state of readiness (which apparently it was not - someone had to be asked to get it running)." 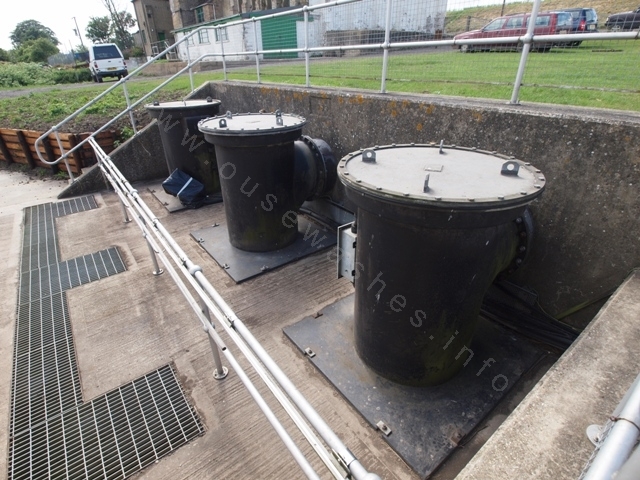 "Are these additional pumps to cope with the volume of water or do they have a breakdown/maintenance situation ?" 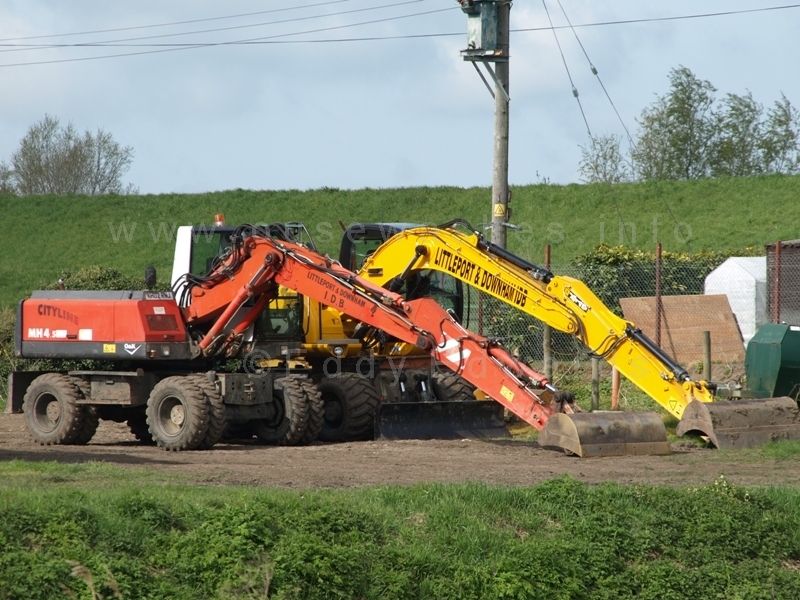 When I visited the site on the afternoon of 28th Dec, the hoses had been moved off the road but two Sykes diesel pumps and a fuel bowser were still in position and the hoses ready for re-connection. 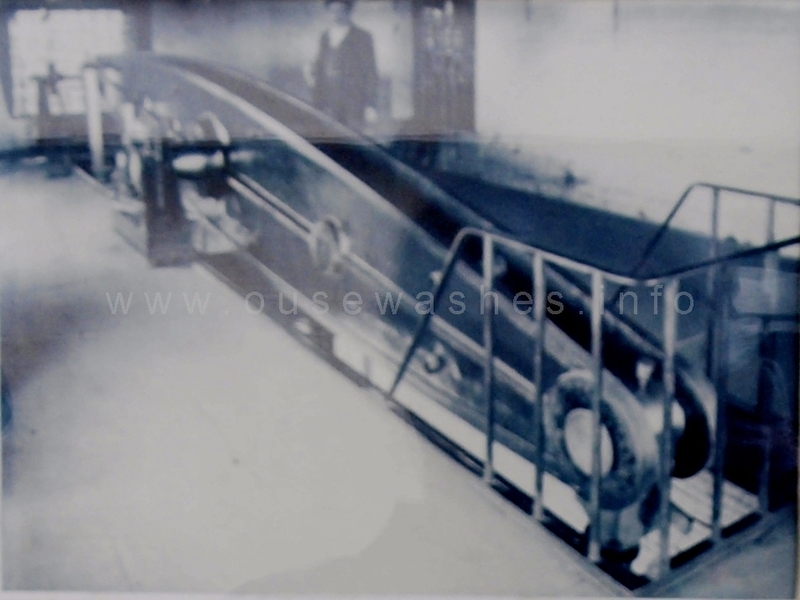 The pumps looked like the Wispaset 150 model, a slienced pump capable of pumping 324m2/hr. The only people on site then were two maintenance men checking the operation of the weed-grab, so as yet I have no answers to the comments above. If anyone has, I would appreciate an e-mail. List of Engine Drivers displayed in the Station. July 2013 update to December 2012 problems. Tony Mitchell and Richard Humphrey raised a number of questions above about the problems in late December 2012. 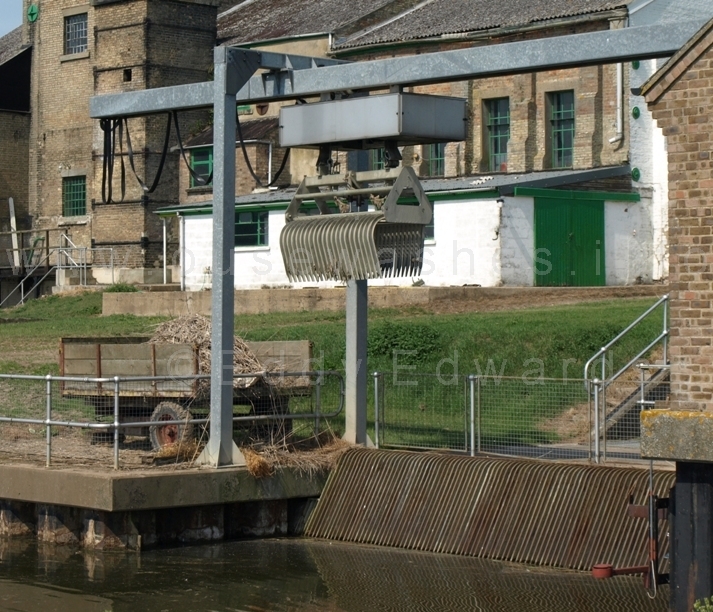 At the Hundred Foot, the situation was exacerbate because one of the electric pumps was away for repair, reducing pumping capacity to 200 tons/ minute. 21st, attempts made to start the Ruston but pump could not be primed. 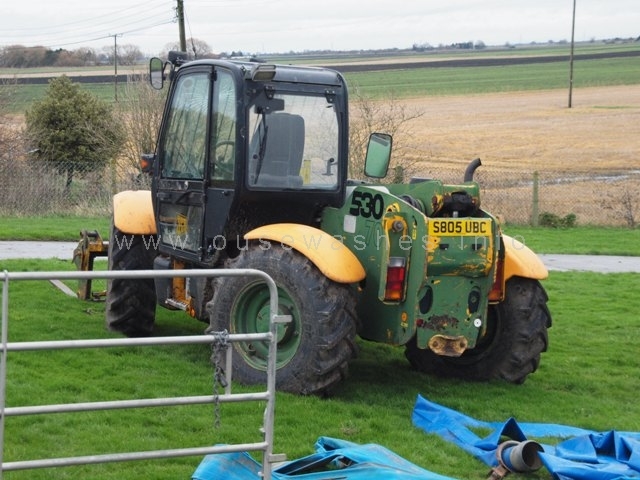 Temporary pumping equipment sought. 23rd, Gary Miller, an ex-employee of the Board, attended site (having been contacted the previous day) to assist with starting the Ruston. Now, Gary knows a thing or two about the Ruston and its pump. Not only did he work on both, he was born and bred next door, his father Donald being the Engine Driver for more than 20 years (see photo right). 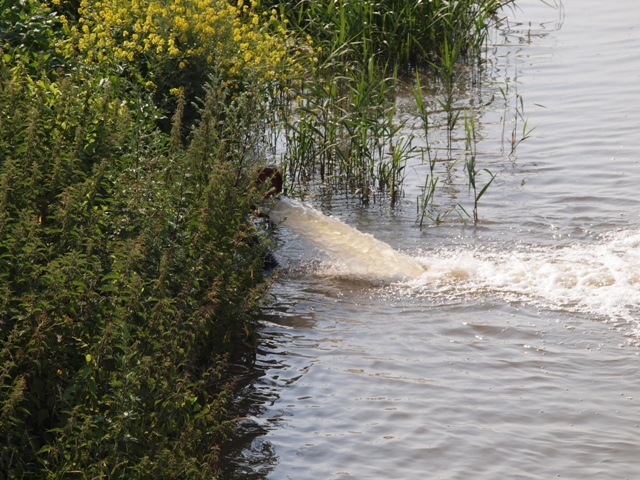 Some issues were found with engine and pump, but further investigations found the intake channel was badly silted. 24th, at 1700hrs the Ruston was started and ran for 3 hrs (pumping at the same capacity as the two working electric pumps together). Levels reduced by over a metre. 27th Dec Portable pumps switched off. Reading between the lines, I think the Board were somewhat concerned about the circumstances have learned lessons and will implement procedures to reduce future problems.